The Michael Jackson tour clicked posthumously into higher gear on Aug. 21 with a court approving a traveling exhibition of the late superstar's memorabilia to coincide with the Oct. 28 opening of This Is It, a film of Jackson preparing for the comeback tour aborted by his death. The court overruled his mother Katherine, who was apparently unhappy about aspects of the plan. Even as the decision was made, one other member of the Jackson clan urged caution about any rush to cash in. Taj Jackson, 36, the late entertainer's nephew (the son of his brother Tito), says that the projects would benefit from more "family input" to ensure his uncle's legacy is protected. He adds: "I don't want this to turn into something like 'let's make as much money as we can.'" On the afternoon of Aug. 21, a Los Angeles Superior Court judge approved concert promoter AEG Live's plan for touring Jackson mementos in three yet-to-be-identified cities. The move came despite objections by Michael's mother Katherine Jackson, who did not attend the hearing. "We are bit confused as to why Mrs. Jackson objected. We didn't agree with the objection," says Howard Weitzman, the attorney for the administrators of Jackson's estate (who are, in accordance with his 2002 will, John Branca, an entertainment lawyer and friend of the superstar, and John McClain, a music executive). The estate administrators manage the late singer's music catalog (which includes the work of the Beatles) as well as his estimated $400 million in debt. Weitzman told reporters that the approved deal is worth "multiple-million dollars" and that "the opportunities are huge." The Associated Press, which put the deal at $6 million, reported that Katherine Jackson, who is not an executor of the estate, may have wanted the memorabilia tour put out for competitive bids. As it is, Weitzman says, the AEG-owned Arts and Exhibitions International, which recently organized an international showcase featuring the relics of King Tut, has been contracted to handle the King of Pop's wares on the road. Weitzman also hints that there is more to come. "It would be an understatement to say that there's a lot we're working on," he says. "All that I think would generate significant revenues." Lawyers for AEG Live have been coy about what items will be on the tour. But they will now be on display as the movie opens. 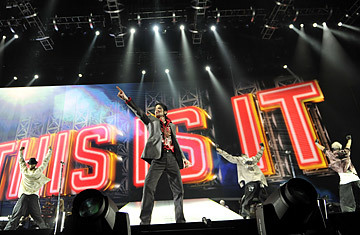 This Is It tickets go on sale on Sept. 27, with the film being in theaters for only two weeks. Distributor Sony also officially confirmed that High School Musical 2 director Kenny Ortega would pull together the hundreds of hours of footage Jackson shot during rehearsals for the This Is It tour. Ortega has said the movie will be an "intimate portrait of Michael as he prepares for his final curtain call." But Taj Jackson voices concern about his uncle's legacy, particularly the movie, which has had its release fast-forwarded by a couple of days. He worries that not only is there insufficient time to prepare the film carefully but that his late uncle might not have intended for the footage to be made public. Based on the small clip of rehearsal footage already released, Taj Jackson says, "I don't think it was up to his standard. It seemed like he was blocking [rehearsing and setting up stage movements]." Taj says his "perfectionist" uncle had previously used such footage to improve his performances and did not intend it for public viewing. Further, he told TIME outside the courtroom, any deadline  especially a shortened one  was a cause for worry. Oct. 28, he says, "is pretty fast for working through 800 hours of rehearsal footage. I don't want to rush this. This will live forever ... People are worried that it's time-sensitive, that people are going to lose interest. But that's not how Michael operated."